Sturtevant, WI (04/05/16) – The daughter carts are designed to fit within the mother cart’s framework. Once inside, the daughter carts are locked into the mother cart. The mother cart and daughter carts are then able to be tugged as one. The daughter carts are equipped with quality casters that allow the daughters wheels to remain on the ground while being towed by the mother cart. The mother-daughter cart delivery system using diamond pattern creates unlimited applications for line side passes. 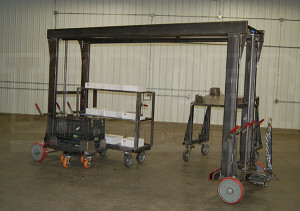 The Topper Industrial’s mother-daughter cart system is the most flexible, user friendly cart delivery system. It completely eliminates the need of a fork truck on the line. Companies are able to create unlimited applications for line side passes with this system. This is possible because the mother-cart is able to pull various types of daughter carts. For example, within the same mother cart frame, an operator can pull a static cart, a tilt cart, a rotation cart, a kit cart, or a tube with many more options. The operator of the mother-daughter cart system performs a daughter cart exchange at the assembly line. An empty daughter cart is exchanged for a full daughter cart and the operators able to work directly out of the carts. The daughter carts are easily locked into the mother cart eliminating the need to couple and uncouple cart trains. The daughter carts also have the ability to have different caster arrangements to reduce push forces and improve maneuverability. This system does not require ramps for the daughters to be carried in the mother. Topper Industrial is exhibiting at MODEX 2016, the largest expo for the manufacturing and supply chain industries from April 4-7, 2016 at the Georgia World Congress Center. Attendees visiting Topper Industrial at booth #647, will learn about fork truck free material handling equipment.